Stocks with notable insider activity is something that I tweet about on a regular basis. These are also the exact type of stocks that I love to trade and alert in real-time. One health care player that insiders are active in here is Community Health Systems (CYH - Get Report) , which owns, leases and operates general acute care hospitals in the U.S. Insiders are buying this stock into large weakness, since shares have fallen sharply by 39.4% over the last six months. Community Health Systems has a market cap of $1.2 billion and an enterprise value of $16.2 billion. This stock trades at a reasonable valuation, with a price-to-sales of 0.06 and a price-to-book of 0.65. This is not a cash-rich company, since the total cash position on its balance sheet is $461 million and its total debt is $15.47 billion. A beneficial owner just bought 929,813 shares, or about $9.54 million worth of stock at $10.27 per share. From a technical perspective, Community Health Systems is currently trending above its 50-day moving average and well below its 200-day moving average, which is neutral trendwise. This stock has been uptrending over the last few weeks, with shares moving higher off its low of $9.81 a share to its recent high of $11.74 a share. During that uptrend, shares of Community Health Systems have been making mostly higher lows and higher highs, which is bullish technical price action. That move has now pushed this stock within range of triggering a big breakout trade above some key overhead resistance levels. If you're bullish on Community Health Systems then I would look for long-biased trades as long as this stock is trending above its 20-day moving average of $10.95 a share or above some more near-term support at $10.50 a share and then once it breaks out above some near-term overhead resistance levels at $11.50 to $11.74 a share with high volume. Look for a sustained move or close above those levels with volume that hits near or above its three-month average volume of 4.75 million shares. If that breakout takes hold soon, then this stock will set up to re-test or possibly take out its next major overhead resistance levels at $13 to $13.28, or even its 200-day moving average of $13.97 to $14.50 a share. 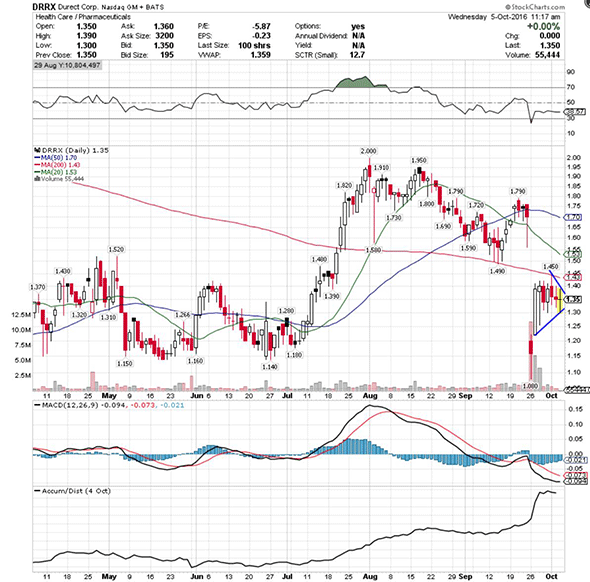 A biopharmaceutical stock that insiders are jumping into here is Durect (DRRX - Get Report) , which researches and develops therapies based on its epigenomic regulator program and proprietary drug delivery platforms. Insiders are buying this stock into some strength, since shares have risen by 14.2% over the last three months. DURECT has a market cap of $188 million and an enterprise value of $172 million. This stock trades at a premium valuation, with a price-to-sales of 11.12 and a price-to-book of 9.71. This is a cash-rich company, since the total cash position on its balance sheet is $32.56 million and its total debt is $19.75 million. A beneficial owner just bought 2,500,000 shares, or about $2.87 million worth of stock, at $1.10 to $1.15 per share. From a technical perspective, DURECT is currently trending below both its 50-day and 200-day moving averages, which is bearish. This stock recently gapped-down sharply lower from around $1.75 a share to $1.08 a share with heavy downside volume flows. Following that move, shares of DURECT have now started to rebound sharply higher off that $1.08 low, and it's now quickly moving within range of triggering a near-term breakout trade. If you're bullish on DURECT then I would look for long-biased trades as long as this stock is trending above some near-term support levels at $1.25 to around $1.20 a share and then once it breaks out above some near-term overhead resistance levels at $1.40 to $1.45 a share with high volume. Look for a sustained move or close above those levels with volume that registers near or above its three-month average action of 1 million shares. 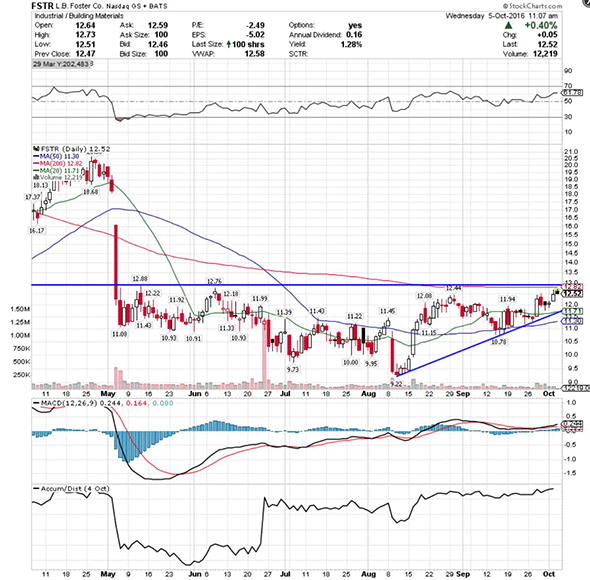 If that breakout materializes soon, then this stock will set up to re-fill some of its previous gap-down-day zone that started near $1.75 a share. One application software player that insiders are loading up on here is Mindbody (MB - Get Report) , which operates a cloud-based business management software and payments platform for the small and medium-sized businesses in the wellness services industry. Insiders are buying this stock into big strength, since shares have ripped higher by 57.5% over the last six months. MINDBODY has a market cap of $818 million and an enterprise value of $715 million. This stock trades at a premium valuation, with a price-to-sales of 6.57 and a price-to-book of 7.95. This is a cash-rich company, since the total cash position on its balance sheet is $87.91 million and its total debt is $15.75 million. A beneficial owner just bought 165,000 shares, or about $3.22 million worth of stock, at $19.38 to $19.87 per share. From a technical perspective, MINDBODY is currently trending above both its 50-day and 200-day moving averages, which is bullish. This stock has been uptrending strong over the last five months, with shares moving higher off its low of $11.91 a share to its recent high of $20.83 a share. 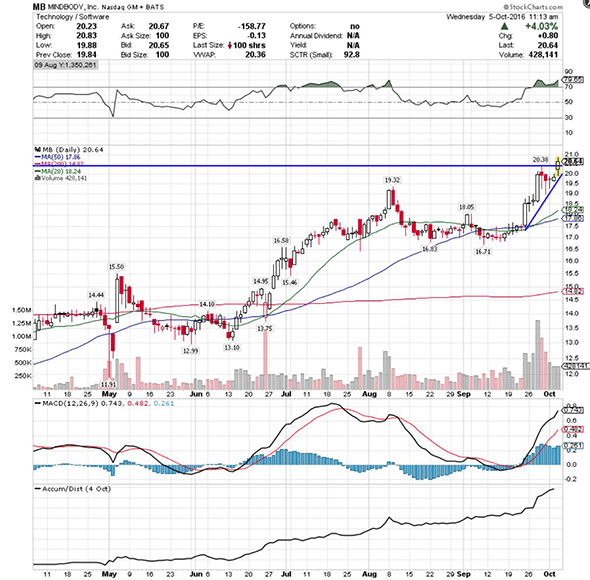 During that uptrend, shares of MINDBODY have been making mostly higher lows and higher highs, which is bullish technical price action. If you're in the bull camp on MINDBODY, then I would look for long-biased trades as long as this stock is trending above its 20-day moving average of $18.24 a share or above its 50-day moving average of $17.86 a share and then once it breaks out above its new all-time high of $20.83 a share with volume that registers near or above its three-month average action of 310,898 shares. If that breakout develops soon, then this stock will set up to enter new all-time-high territory, which is bullish technical price action. Some possible upside targets off that move are $25 to $30 a share. One services player that insiders are in love with here is LB Foster (FSTR - Get Report) , which manufactures, fabricates and distributes products and services for the rail, construction, energy and utility markets worldwide. Insiders are buying this stock into notable weakness, since shares have fallen sharply by 25.3% over the last six months. LB Foster has a market cap of $131 million and an enterprise value of $267 million. This stock trades at a reasonable valuation, with a price-to-sales of 0.22 and a price-to-book of 0.70. This is not a cash-rich company, since the total cash position on its balance sheet is $32.81 million and its total debt is $170.90 million. A beneficial owner just bought 165,000 shares, or about $3.32 million worth of stock, at $19.38 to $19.87 per share. From a technical perspective, LB Foster is currently trending above its 50-day moving average and just below its 200-day moving average, which is neutral trendwise. This stock has been uptrending over the last two months and change, with shares moving higher off its low of $9.22 a share to its recent high of $12.73 a share. During that uptrend, shares of LB Foster have been making mostly higher lows and higher highs, which is bullish technical price action. That uptrend has now pushed this stock within range of triggering a big breakout trade above some key overhead resistance levels. If you're bullish on LB Foster, then I would look for long-biased trades as long as this stock is trending above its 20-day moving average of $11.71 a share or above its 50-day moving average of $11.30 a share and then once it breaks out above its 200-day moving average of $12.82 a share to $12.88 a share with high volume. Look for a sustained move or close above those levels with volume that hits near or above its three-month average action of 63,611 shares. If that breakout fires off soon, then this stock will set up to re-fill some of its previous gap-down-day zone from May that started near $19 a share. My final stock with some decent insider buying is energy player Superior Drilling Products (SDPI - Get Report) , which manufactures, repairs, sells and rents drilling tools in the U.S. and internationally. Insiders are buying this stock into large weakness, since shares have dropped by 35% over the last six months. Superior Drilling Products a market cap of $16.9 million and an enterprise value of $33.5 million. This stock trades at a fair valuation, with a price-to-sales of 1.65 and a price-to-book of 1.42. This is not a cash-rich company, since the total cash position on its balance sheet is $211,000 million and its total debt is $20.10 million. A beneficial owner just bought 500,000 shares, or about $500,000 worth of stock, at $1 per share. From a technical perspective, Superior Drilling Products is currently trending below both its 50-day and 200-day moving averages, which is bearish. This stock has been downtrending badly over the last three months, with shares moving lower off its high of $2.72 a share to its recent low of 86 cents per share. During that downtrend, shares of Superior Drilling Products have been making mostly lower highs and lower lows, which is bearish technical price action. 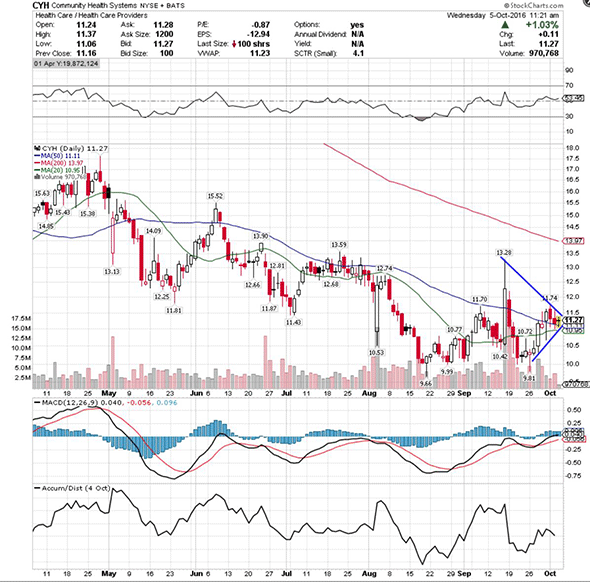 If you're bullish on Superior Drilling Products, then I would look for long-biased trades as long as this stock is trending above some near-term support levels at 91 to 86 cents per share and then once it breaks out above some near-term overhead resistance levels at $1 to its 20-day moving average of $1.02 a share with volume that registers near or above its three-month average action of 100,202 shares. 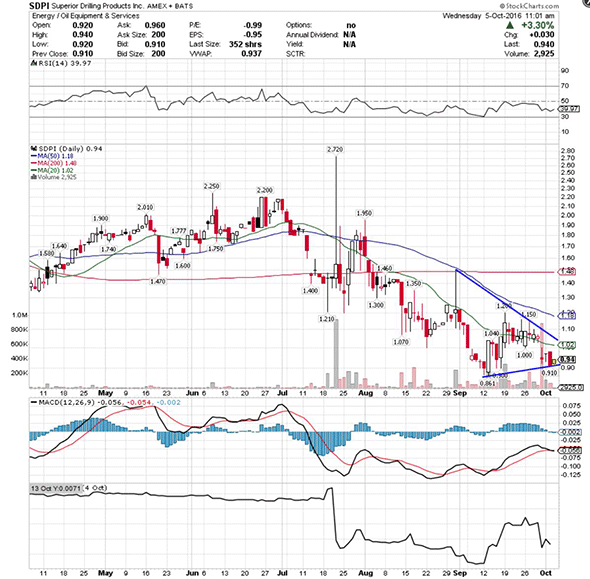 If that breakout fires off soon, then this stock will set up to re-test or possibly take out its next major overhead resistance levels at $1.15 to its 50-day moving average of $1.18 a share, or even $1.20 to $1.30 a share.